The BBC made a great short film about the book I helped fact check, New York Diaries: 1609-2009, which is coming out in a matter of days!! It was interesting seeing the entries they chose to highlight. I’m going pick some of my own next week. Bloggers are the 21st century diarists, or I should say, early 21st century. Something else is bound to replace blogs soon. Sadly, I doubt the blogs of today will be tucked into virtual attics somehow and be found a hundred years later the way diaries are. 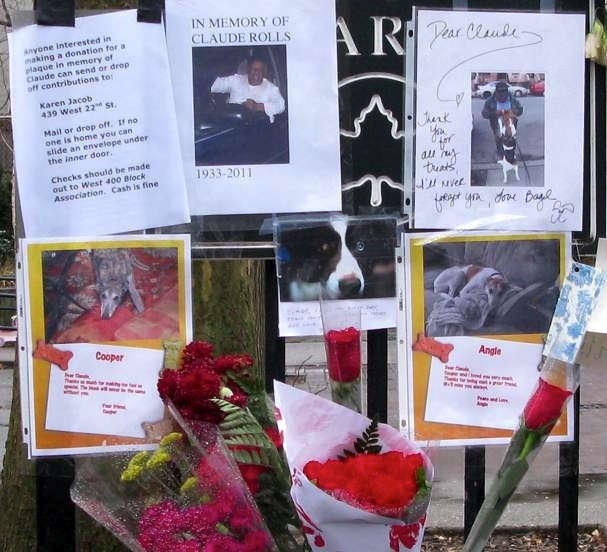 A memorial for someone named Claude Rolls on West 22nd Street. I thought he must have been a dog walker, all the signs had pictures of dogs. But it turns out that among his many fine qualities he was good with people’s dogs. He died on December 14th, the day he bought a new van which he was very excited about. The article says he wanted to die in that van, and he did!